amela Rose is a San Francisco jazz and blues vocalist who has thrilled audiences locally and internationally with her swinging, soulful style. Rose is that rare breed of entertainer who connects solidly with her audience by always delivering a personal and unforgettable musical experience. Her rich, warm voice and easy rapport with excellent musicians moves jazz and blues audiences of all ages. Originally from Southern California, Rose attended UC Berkeley and quickly met up with Hammond B-3 organist Merl Saunders, who took her on tour in 1977. This experience helped to define the strong passions that keep music fresh for Pamela today: writing and developing songs which are personal to her, a strong love for improvisation and spontaneity that comes with performing live, and a crazy adoration for the soulful sounds of Hammond B-3 organ. Home from the road, Rose teamed up with guitarist Chris Cobb and formed the Eights, then Wild Kingdom, both all original dance bands that dominated the club scene of the early '80s. During this period Rose also met vocalist Glenn Walters (of the Hoo Doo Rhythm Devils) and together they mounted a show of R & B duets called When a Man Loves a Woman. They were promptly tapped to join the Zasu Pitts Memorial Orchestra, the 14 piece Motown Dance Band who were unquestionably the darlings of the corporate party circuit and dance clubs throughout the '80s. Challenging herself and searching for a more intimate sound, Pamela teamed up with pianist Nate Ginsberg, penning tunes and arranging 1930's style jazz standards. This led to two recordings, the first On the Jazzy Side of Blue (1993) which was nominated for two BAMMIE Awards (Best Jazz CD, Best Vocalist), and the second, Every Time I'm With You, which had the distinction of being featured in the Sharper Image National catalogue as the only vocal jazz CD offered. Both of these recordings garnered tours in Denmark and France, culminating in being invited as one of the headline acts at the Cophenhagen Jazz Festival. Now that she had found her footing in jazz performances and clubs, Rose reached back to her love of Hammond B-3 Organ and teamed up with organist Tony Stead (Gospel Hummingbirds, Family Stone) to create an all original soul jazz CD You Could Have it All. With B-3 master Jimmy Pugh (Robert Cray) producing, and featuring a duet with Glenn Walters on the title track, this funk splashed, soul jazz CD garnered Rose a feature on NPR's All Things Considered in recognition of her effort to compose new material to show off both Hammond Organ and her expressive voice. Rose's fourth release Just For a Thrill, a thoughtful, romantic and intimate album featured her songwriting and production partner, guitarist Danny Caron (Charles Brown). Rose also enticed some of her favorite West Coast musicians to join her on this recording date, John R. Burr on piano, John Wiitala on bass, Jason Lewis and Bryant Mills on drums, Tony Stead and Wayne De La Cruz on Hammond Organ, Charles McNeal and Jeff Ervin on saxophones. 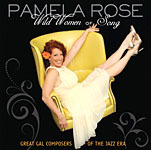 In 2009 Pamela Rose began her most challenging and rewarding endeavor of all: a recording project featuring jazz and blues standards composed by women songwriters. With Grammy award winner Leslie Ann Jones at the helm, their collaboration resulted in Wild Women of Song: Great Gal Composers of the Jazz Era. This highly regarded work sparked an entirely new chapter in Rose's career, as she researched and mounted a travelling multi-media theatrical concert which played to packed houses in Los Angeles, London, New York, San Francisco and is slated to appear at the Monterey Jazz Festival 2011. Pamela Rose is married to magazine publisher Steven Dinkelspiel, who puts up with her crazy nighttime schedule and is her greatest fan. They have two fabulous children Emma and Eli, who keep them humble and on their toes. Pamela also still sings with Glenn Walters in their private party dance band, Sidepocket. Rose continues to expand her club engagements in the Bay Area and abroad, loves singing jazz and blues, is still crazy about the B-3 organ and is on the faculty of the Jazz School in Berkeley, CA. All About Jazz musician pages are maintained by musicians, publicists and trusted members like you. Interested? Tell us why you would like to improve the Pamela Rose musician page.